I. "Grillan Sparrow Earl of Sandwich Collection William Hayes 1782"
II. "American Grossbeak Earl of Sandwich Collection William Hayes 1782" III. "Brazilian find(?) Robt Child at Osterley W. Hayes"
IV. Green Parrot, with later inscription "Earl of Sandwich No. 76 W. Hayes 1782"
The Brazilian finch (no. 3) formed part of the remarkable menagerie of exotic birds housed by Robert Child (d. 1782) at his aviary at Osterley, Middlesex, and painted in the 1770s for display in the aviary's parlour by the artist William Hayes (d.1802). Hayes later published them as Portraits of Rare and Curious Birds with their Descriptions. Accurately drawn and beautifully coloured from species in the Menagery [sic] of Child, the Banker at, Osterley Park, nr. London, 1794-1799. 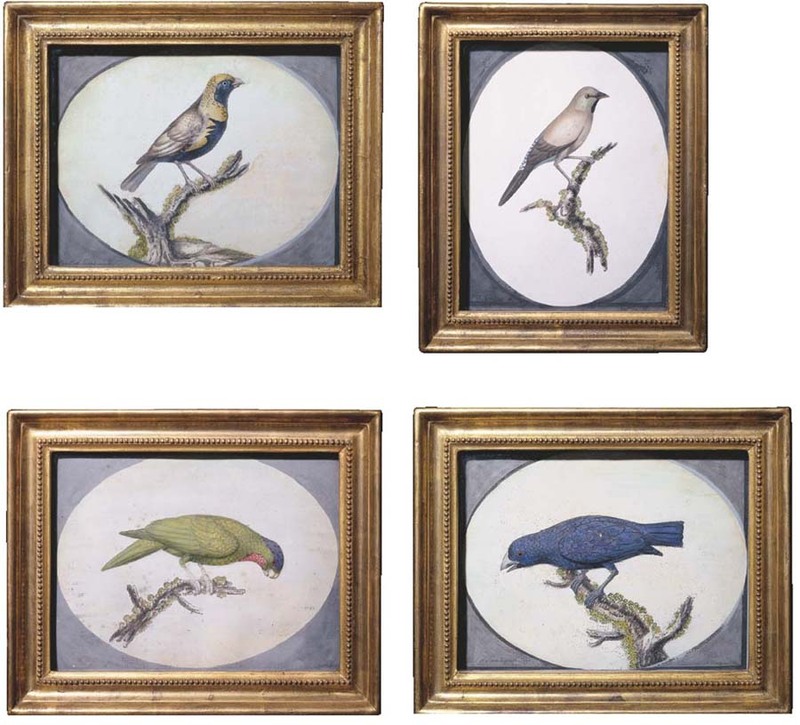 The other birds were published in Hayes' Portraits of British and Exotic Birds, London, 1771-1778 (see Sotheby's, 26 April 1982, lot 178). THE PROPERTY OF LEO SCHOFIELD, A.M.